Liam Postlethwaite, Singapore U19s Rugby Player, took some time and spoke to us about how he got into the sport and how he realised his dream of representing his country. Liam was also an attendee at UFIT Kids Camps back in 2016 and is now giving back and helping out with the camps in coaching! With the new year comes an adjustment to the way we run our UFIT Kids Camps, providing the best possible development path for your children. One of the most exciting changes is that our Multisport Camp will now run for ages 5-12 years, while our Sport-Specific Camps for a range of sports including rugby, football and swimming will cater for ages 12-18 years. Chris is one of the head coaches at the upcoming kids rugby development camp happening from the 9th to 13th April. An affable and soft-spoken man with a fiery beard, Chris is well liked and respected by his young charges. We caught up with him before the camp to ask a few questions! Tell us a bit more about yourself – your background, what does fitness mean to you, and what do you love most about working with your clients? I've always played sports and love being active, so working in the fitness industry has been an easy choice. I studied exercise and sport science at the university in the UK, and have subsequently worked within a range of sports at both elite and club levels. I specialise in strength and conditioning, post-injury strengthening, and youth athlete development. I've had my fair share of injuries over the years, so overcoming and preventing them has always been a big goal for me. To get someone fit and healthy is very individual. Whether you aim to run a marathon or walk pain-free, fitness training should help you to achieve that goal. What I love most about working with my clients is that each person is an individual, everyone has something that makes them unique. It is the same in fitness training. Each person responds differently to the training programs, so finding the best and most effective way to train is something I really enjoy. I'm always looking to learn and improve myself. The more I know, the more I can bring to my clients. So continuing my development through my master’s degree in strength and conditioning is really helping this. You will be running the week-long UFIT Rugby Development Camp next week. What skills and qualities can kids develop through rugby training? There’s plenty of qualities that can be developed from rugby, not only in terms of skills, but also in physical and mental strengths. The kids will gain endurance and speed, improve hand-eye coordination, and also learn self-discipline and self-confidence. These are all positive attributes that you want to see in your kids as they grow up. The UFIT rugby camp is five days of healthy social interaction with other kids their age, learning the best qualities from each other, and be under the guidance of expert coaches who have played rugby at the elite levels. Chris is a level 2 rugby coach with a bachelors of science in exercise and sports science. He has worked with the England Under-20 rugby squad, as well as with top English rugby club the Exeter Chiefs as their strength and conditioning coach and the head of performance focusing on youth players ages 13-18. Chris coaches and plays in Singapore with the Bucks 1st XV, and as the captain he led them to their first premiership win in six years. Chris is currently completing his masters in strength and conditioning. Here's John Brake - former England rugby player - and one of our well-known head coaches here at the SCC and UFIT Rugby Holiday Camps coach. John's also a Personal Trainer at UFIT Amoy - and as someone who has been on the rugby world stage he's really well placed to teach kids the physical and mental qualities needed to succeed in this great sport - as well as the challenges of every day life. 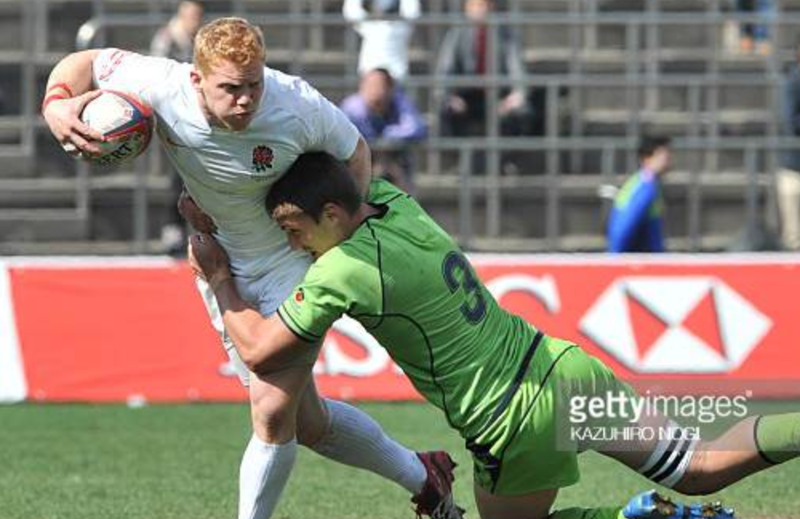 John represented England as a schoolboy at Millfield in the under-16 and under-18 levels. After leaving and joining Northampton he progressed to the under-20 side and made his debut for the England Sevens team in San Diego in 2007. John went on to represent England Sevens for six seasons, playing in 41 World Series Tournaments, two Commonwealth Games, a Sevens World Cup and ten European Tournaments. John captained the winning England Sevens team in the 2012 European Sevens Grand Prix. We asked John more about his background and approach to kids' coaching. What sports did you play as a kid? I played and took part in every sport possible. I loved playing football, hockey, rugby & basketball. I was never a great swimmer though and just felt I was more of a sinker. My parents were brilliant at giving me opportunities and support. They never pushed me, just highlighted to me at times why I enjoyed sport so much. They were just very supportive. What pushed you toward professional rugby? When I was ten I went to boarding school where rugby was the no 1 sport in the school. The enthusiasm and buzz around game day just ignited my passion to play with my mates. I had some very influential coaches in the senior school who were incredible at man-management and inspiring. What values did you learn that you share with kids you coach? a) TRUST. You have to trust your team mates and yourself to get the job done. b) COMMITMENT. You set a goal and you go out to achieve it with everything in your power to do that. It's like a switch. You're either on or off. c) ENJOYMENT. Unfortunately people can lose sight of this when playing and coaching. The only reason we all took part to start with was to enjoy the experience. Keep things fun. d) DISCIPLINE. To turn up to training on time. To make the extra effort to prepare. To put the team first at times. Practice. This has been so important my entire career. e) ENERGY. Bring as much as you can. Whether that's mental or physical. It's infectious to those around you. It has to be enjoyable. And about kids first. It's good to develop the individual and install good values to develop and enhance their lives on and off the pitch. I love their energy, and having the challenge and the opportunity to witness them really improve over a period of time. Kids are not pros. They are all here for the love of the game, not for a pay cheque. It's refreshing! I'd like to think they'll improve their key skills. They’ll end up knowing how effective they are and how to play to their strengths. I want them to leave with loads of confidence and to make decisions for themselves. At the end of the day, they're the ones on the pitch. Not the coaches. A sense of responsibility to pass on my knowledge and love for the game. To enhance someone's life is pretty cool. Plus the fact if I can have the same effect as my coaches did on me that's pretty incredible. I once took an intro session to contact skills in a big inner city London group. It's a charity to help less privileged children. I told the 6ft 3" 18 stone 16year old to demonstrate what I just told in tackle technique. I told him 25% intensity. I don't think he heard and took a 10m run up at 100% and smashed me. I was on my back surrounded by 30 boys crying with laughter. I now always emphasise. It's only 25% when demonstrating. Life has been very exciting since I moved over with my wife UFIT Nutritionist Becky six months ago. Of course getting married and moving to the other side of the world has been an incredible experience for me. The people and opportunities I've had have been really great since I arrived. The diversity here is astonishing. It's been fun exploring a new place. With regards to rugby I've been thoroughly impressed with the competitiveness of youth rugby and the high standards at a number of tournaments I've been to. It's surprised me and has been really good. John Brake retired from Rugby in the summer of 2016 after a ten-year career playing for England 7s and Northampton Saints. Throughout John’s career he received world class strength and conditioning experience and soon gained a passion for it. This interest led to John becoming a fully qualified PT and taking on clients. John can assist clients with a variety of health and fitness goals whether that’s gaining muscle, improving body composition or just becoming fitter to support a lifestyle. Meet John Brake - former England rugby player - and kids coach at the UFIT Rugby Holiday Camps. John's also a Personal Trainer at UFIT Amoy - and as someone who has been on the rugby world stage he's really well placed to teach kids the physical and mental qualities needed to succeed in this great sport - as well as the challenges of every day life.